There was rain in the forecast. I didn’t really want to go to the game. But my friend Brandon was visiting from San Diego. He wanted to check out the new stadium. That’s right. We were shown on the Jumbotron, and as you can see in the photo above, Brandon was ready with his camera. Brandon is always ready, it seems. Brandon had forgotten to bring his baseball glove, so I lent him one before we left my place. Big mistake. He ended up using it to rob me of a home run during the first round of BP, and then he rubbed it in my face for the next 15 minutes. I had a few close calls early on, but nothing was working out in my favor, and for a while, I was concerned about getting shut out. The sky was already dark gray, and I knew that BP could get wiped out at any moment. By the time the Royals started hitting, there were a few raindrops falling. The rain intensified and batting practice was done. As the players and coaches cleared the field, I raced to the seats behind the 3rd base dugout and arrived just in time to get some random equipment guy to throw me a ball. That made me feel a little better, but I was still disappointed. That was my fourth ball of the day. Not terrible for a game at Yankee Stadium with only 30 minutes of BP instead of 90. The rain, I must admit, ended up working in my favor because it chased lots of people away. I’d decided to sit out in right field during the game (regardless of the weather) so now that I had some empty seats to work with, I was excited at the possibilities. Brandon made me pose for it as we headed to our seats, and he insisted that I include it in this entry. I nearly caught Ramiro Pena’s first major league home run in the bottom of the fifth inning. It was hit RIGHT in my direction, and I couldn’t believe my eyes. I jumped up and held my ground on the staircase, 100 percent sure that it was going to sail right to me in the fifth row, but then it died a bit (perhaps because the air was cold and damp) so I began to drift down the stairs, but then I got blocked by a cotton candy vendor at the last second, and it was over. The ball bounced off the bare hands of a man in the front row, and I still would’ve had it if it’d deflected back instead of sideways. It was frustrating, to say the least, but I didn’t blame myself. Watch any major league outfielder react to a fly ball hit right at him and he’ll do the same thing: he’ll hold his ground for a moment and THEN start drifting once he determines where it’s going to land, so whatever. The guy who ended up snagging that ball graciously tossed it into the bullpen when the relievers asked for it. In exchange, they tossed back another ball, and get this…it wasn’t signed, and it wasn’t even commemorative. It was just a standard Selig ball, and when the guy got it, he wasn’t too happy. To his credit, he stayed calm and simply asked the guys in the bullpen to autograph it. Once he got the go-ahead, he tossed the ball back, and it was returned to him five minutes later with the autographs of EVERYONE who was out there — at least a dozen guys — including Mariano Rivera. Very cool. I couldn’t believe what happened next. I found myself standing all alone on the staircase as the other fan dropped the ball…and then the ball started bouncing right back down the steps toward me. I must’ve given more than 20 high-fives (and fist-bumps). It was truly insane. Then I went back and grabbed my hat. I was soooooo happy. Snagging a grand slam had been one of my lifelong goals, and now, finally, after two decades of going to games, I had finally done it. I called my parents. I called my girlfriend. I called a couple other people. I would’ve called everyone I knew if there were more time. The Yankees ended up winning the game, 8-2. For Cano, it was his 25th home run of the season and 87th of his career. But here’s the cool stat: it was his 202nd hit of the season. I know that’s not a round number or a milestone or anything like that. I just like that fact that he has more than 200 hits and that I not only got one of them, but I got one AFTER hit No. 200. 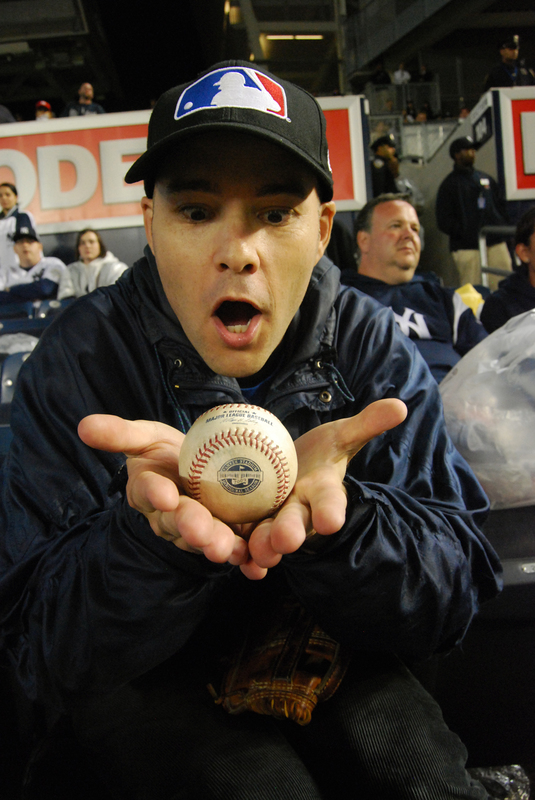 I posed with the ball about 50 more times after that (outside the stadium, on the subway, etc.) but I won’t torture you with all those pics. • 487 balls in 55 games this season = 8.85 balls per game. That would have been a good time for Cabbage Patch, Part III. Nice Catch. Wow, I think your home run drought is over with. So I am assuming that you won’t mind going to New Yankee Stadium as much? And are you going to go to either the Oct. 3th or 4th game at Citi Field? If you are, I’ll see you there. You know what?! This morning, I saw that Grand Slam on mlb.com and thought: Was that Zack? Somehow that elation looked just like 9/15 at Camden. And your post just confirmed my thoughts. Great! Congrats again Zack. In one way i’m not surprised you got it but at the same time i can’t believe you got it too. That was incredible and i must of rewinded my tv about 30 times last night when i saw the Grand Slam and then you snagging it. Right when i saw someone pick it up and noticed the “SHAVED” head i knew it was you. lol. Enjoy it dude and again congrats. Catch ya lata. Congratulations on your first Grand Slam Home Run ball! Congratulations my friend! Question: Will you attempt to get it autographed? I would still like to know what it is with you and rain this season! Maybe it just means you’re in for one helluva 2010! Congrats again, well played & well deserved. Congrats! On the last day of the season, do players ever give away their bats, batting gloves, etc? The second line of this post says “I didn’t really want to go to the game.” And you got a grand slam ball. wow – two homeruns in about a week…or less? sweet. hey, in that first picture (on the big screen) are you guys in the legends suite area? how’d you swing that? I thought it was off limits to commoners. Zach, out of curiosity, do you get recognized a lot at games you attend? KC Royals baseball in 2009 – very memorable games for The Baseball Collector – single game ball hawk record, a great day of catch, and a grand slam homer run. Congrats. One correction though: in this post you said the Yankees have the largest scoreboard in baseball (59′ x 101′). Actually, Kauffman Stadium’s “crownvision” is bigger (84′ x 105′). Anyway, I accomplished my goal of getting a Twins’ commemorative ball at Kauffman Stadium this weekend! Thanks for the inspiration and I hope to see you in 2010. Congrats on the HR ball. But the really cool stat is that he set a Yankees franchise record for the most players with 25 HR’s in a season. You, my friend have a record-breaking ball – a grand-salami nonetheless. Also, I wasn’t really paying attention at the time, but I think I heard the Sportscenter anchors say something about him becoming the third second-baseman in MLB history to have 25 HR’s and 200 hits. It was something like that, I tried to look it up but nothing got nothing so I dont know if it is true or not. The DBacks wrapped up their home schedule this weekend, but fall ball starts in two weeks. Oh, and no contacts for me. hey, I have another question, you mention in your stats that you have 10 game homeruns not counting toss ups from outfielders. how many do you have if you include toss ups from outfielders? It was great seeing you last night. Awsome about the grand slam! You actually inspired me to stick around a bit. I was tired and wet and had to get up today at 4:00am so I was gonna give up and leave until you and I talked. Then I got determined. I ended up heading out to the bullpen and got a KC pitcher to toss me one right before the game started. I got heckled by 2 fans big time. But Who cares. Anyway, again itwas nice seeing you and Brandon. The Yankees scoreboard may not be the biggest, but it is the highest resolution board in the WORLD, and the biggest screen belongs to the cowboys. I was also on the Jumbotron waiting for batting practice to begin, but unfortunately i didnt see myself. The guy next to me was like “Dude ur on the scoreboard!” But when i turned around it was gone. Happy just caught Prince Fielder’s homer in Colorado! Did you see yourself on the highlights? congrats on the 4 bagger snag. long time comming!! Congrats Zack! I was at Kauffman over the weekend and ran into your buddy Garrett. What a nice place to ballhawk! They no longer allow people to attempt to get balls out of the fountain though and the gap that held those balls that you went and got is now cleaned out a lot more frequently. However, there is a ladder propped up against the side now to make it really easy if anyone wanted to risk climbing down there. Congrats on the grand slam ball Zack. When I started reading the blog, I thought the JumboTron might have been the highlight of the night. Where do you put all of those “special” balls? You just don’t throw them on the pile do you? I’ll enjoy the new stadium when the Yankees have back-to-back 90-loss seasons and the attendance drops to a mere 38,000 per game. I’m planning to be at Citi on October 4th. Nah, no autograph attempt. Just owning the ball is enough for me. Maybe, if fans at Yankee Stadium were actually allowed to get near the players, I’d consider getting it signed, but as things stand, no way. It’s not worth the hassle. Yup, some guys give away their equipment. No, we weren’t in the Legends. We were just a couple rows behind the back railing of it. As for home run toss-ups…heh, just one. Yup, I get recognized at just about every game I attend, even if it’s in some random city and I don’t even mention on the blog that I’ll be there. It’s pretty wild. My bad. Thanks for correcting me. I just tweaked that line in the entry. Great seeing you too. Glad we got to catch up. I did see that clip, but thanks for the link. No, I keep the very special balls separate. I actually need to buy more of those ball-cube cases. Zack, Congrats on the grand slam! Has anyone noticed the controversy going on in cincinnatti against the cards on whether or not the balls are being rubbed up? Smoltz had problems last night and Carp has thrown out a lot of balls today. Has anyone caught a game ball that didn’t look rubbed up?